When you delete a file, it goes to the Trash, but still resides on your Mac. Sometimes you may even don’t know that there’s a trash folder. For example, each disk partition and external drive has its own hidden bin. Apps like Mail and Photos have separate trash folders too. So, Trash Bins finds all your junk folders and allows you to empty them all at once without browsing through every corner of your Mac. Scan: Navigate to the Trash Bins module and click Scan. Review summary: Look through the list of the automatically selected types of data. Start quick cleanup: Hit Empty at the bottom of the window. Or, switch to the detailed results, check the full list of found items, and make your choice. Start the cleanup: Click Empty. Local Mail Trash, which contains emails deleted in the Mail application. Photos Trash, which contains images deleted in Photos. Gemini Duplicates, which contains duplicated images that you have earlier removed from a Photos library using Gemini. Startup Drive Trash, which contains items deleted from the main disk and items removed from iCloud. External Drive Trash, which contains items deleted from external drives (a number of such trash folders equals a number of external drives). You can remove these files safely to reveal a lot of disk space. 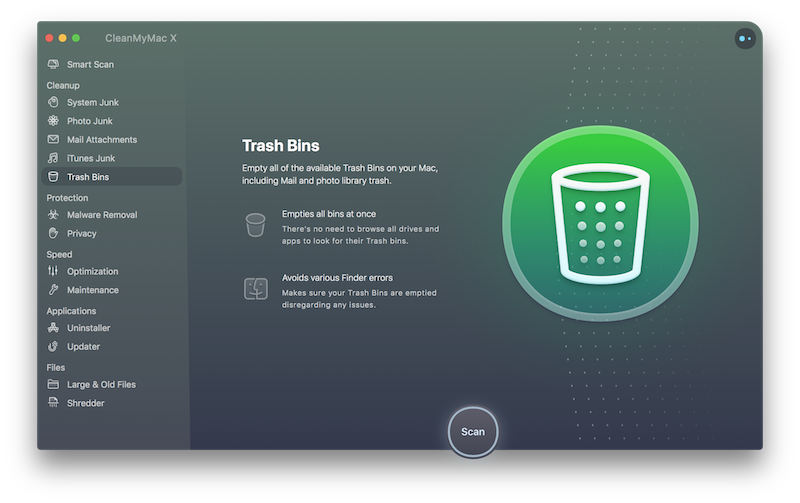 CleanMyMac adds all trashed items to the cleanup list automatically, except for Gemini Duplicates, which can be removed via the Photos app only. Also, starting from macOS 10.13, Photos Trash can be removed via the Photos app only. Open Photos and navigate to the Gemini Duplicates album. Then, select and control-click all contents of the album. From the shortcut menu, choose Delete Photos/Videos. Starting from macOS 10.13, Photos files can be removed via Photos app only. If you have an earlier version of macOS, CleanMyMac easily removes these files without additional actions. So, to delete Photos library trash on macOS 10.13 and later, open Photos and navigate to the Recently Deleted album. Then, click Delete All in the upper right corner of the Photos window.